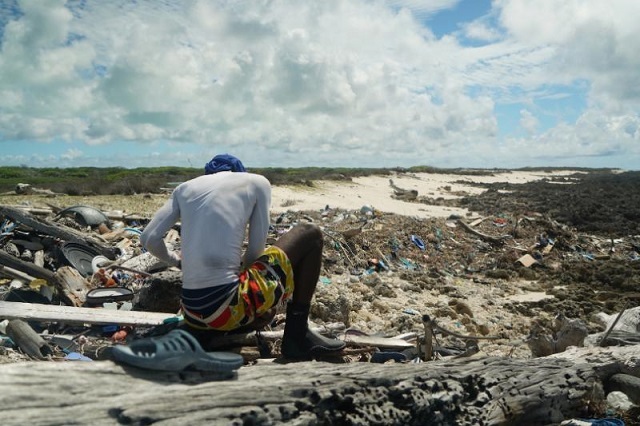 (Seychelles News Agency) - Twenty-five tonnes of waste -- including some 50,000 flip-flops -- were collected in a five-week clean-up on the Seychelles’ remote atoll of Aldabra. Five volunteers from the University of Oxford and seven from Seychelles joined the Seychelles Islands Foundation (SIF) team on Aldabra for the clean-up project aimed at clearing the island of man-made rubbish, while also quantifying the amount and types of plastic and finding a sustainable way to process it. Co-leader of the initiative, Jeremy Raguain, an SIF Officer, told SNA that the cleanup took place in three phases. “During the first phase, we concentrated on just collecting as much waste as possible, carrying out surveys on the waste composition and weight at the end of each session. In the second phase, we had to move all the waste collected to various locations along the whole coastline that is accessible to small boats. This meant carrying sacks of up to 15 kg and slings of up to 60 kg,” he said. 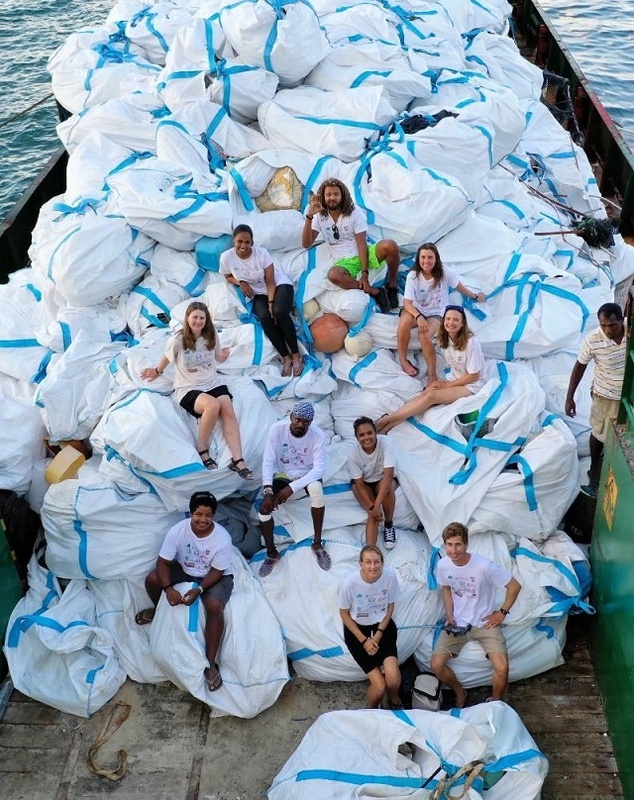 By phase three, it was all hands on deck as the whole of the SIF team on Aldabra, coast guards and volunteers had to move hundreds of gunny sacks from the beaches. The bags were placed onto the SIF boats which shuttled the waste out onto the Spirit of Ton Joe ship. Due to the limited resources and space at the camps, two teams were formed; one led by April Burt from the University of Oxford and the other by Raguain. Burt’s team was deployed to Dune D' Messe and Cinq Cases, both of which have treacherous long walks from the lagoon side where the boat drops and collects the teams and to the coast where the field camps were. Raguain’s team was based at Dune Jean Louis along the coastline. Aldabra -- one of the world’s largest atolls -- is a UNESCO World Heritage Site in Seychelles, a group of islands in the western Indian Ocean. The Atoll which is located 1,000 km from Mahe, the main island, consists of four main islands of coral limestone separated by narrow passes and enclosing a large shallow lagoon. The cleanup presented some challenges and that included “working from first light to last light as the intense heat and light pose the risk of sunstroke and dehydration being always present,” said Burt, also a co-leader of the initiative. She added that there were also immediate dangers walking on the sharp and unforgiving limestone that surrounds the whole atoll- to remove fishing nets and lines with knives. “The wrong placement of foot could lead to a serious cut or puncture, so we had to work with care. One of the biggest mental challenges was also the fact that as humans we only had the capacity to clear the top layer of waste we found on the beaches, even though we were on our hands and knees raking through the sand, we could only reach so much,” she said. On a more positive note, the expedition team leaders told SNA that the cleanup project said despite the challenges, volunteers found time for drift snorkelling, seeing turtles and sharks, and admiring the incredible nature on Aldabra. Upon returning to the main island, the group met with President of Seychelles, Danny Faure, last week. “Despite the cuts, burns, headaches, pains in your muscles and days you did not want to get up again, you all became one team with the most empowering story: that change is possible. So to say thank you to this remarkable team is not enough, but please know that SIF has the deepest respect for your commitment and is indebted to you all,” she added.